looking at those frets here .. you still have plenty of height on them. and could probably get away with fixing them by sanding down and re-crowned. 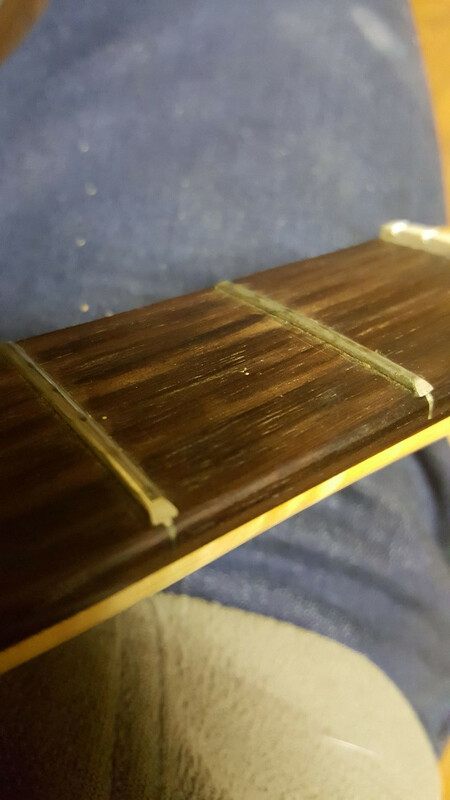 I've linked the guitar setup thread for reference where their is a video explain how dress and crown your frets.. just be aware.. its soft metal and light sanding has a massive effect, use a high grit paper and a light touch. 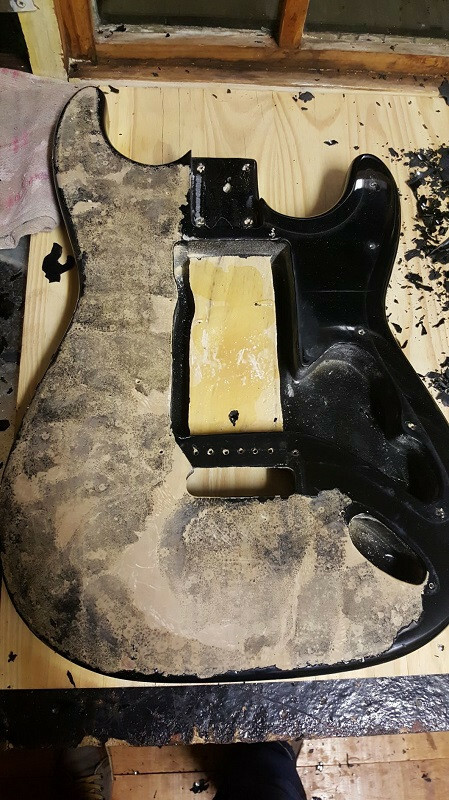 If i can suggest some YouTube channels to watch which offer great DIY advice.. Crimson Guitars and Guns and Guitars are both worthwhile. 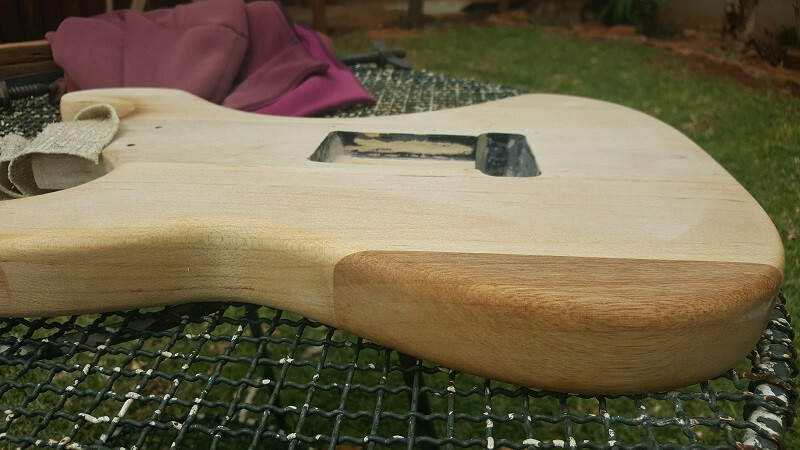 despite my "research" which was honestly done for the wood despite what I posted, I really want to see how it goes , do you have an Idea on the direction you want to go in-terms of finish? tedibear Thanks for the links. I'll check em out when I get to 'that' bridge. No issue man. We had a good laugh. tedibear do you have an Idea on the direction you want to go in-terms of finish? That flaming on the neck is prettttyy though, the spilt not so much. Wonder if that will be a issue in a while? I'd guess not, but careful not to over tighten neck screws when re-assembling. That crack in the heel looks bad to me, and I see another one opening up as well. One suggestion might be to cut a slot at the back of the heel, and epoxy in a stiff piece of wood. This could be "key"-shaped to act as a "clamp", drawing the ends of the neck together. You will have to be inventive here, to make up a system which will allow you to "clamp" that piece of wood into the slot, heel to head. 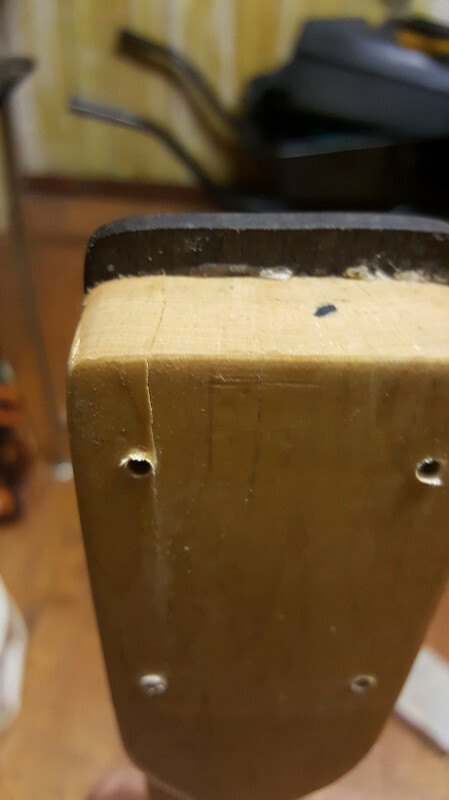 I am hesitant to suggest a hole from one side to the other (between the front and rear mounting screws) with a dowel epoxied in, seeing as there is not much wood left around it. A thin dowel maybe? One trick I never got to work as well as suggested is to "flow" epoxy epoxy into the cracks, using a hair dryer to heat up the epoxy to a watery state. This obviously depends on the type of epoxy used, and the heat will affect the curing time too. Hmm, I would go for the "clamp" at the rear, with superglue (super thin type) wicked into the cracks as well. They tell me superglue does not last forever. No glue does, I guess. I agree on the frets - could be salvaged. modulator Hmm, I would go for the "clamp" at the rear, with superglue (super thin type) wicked into the cracks as well. They tell me superglue does not last forever. No glue does, I guess. As above, I would also use superglue (super thin type). 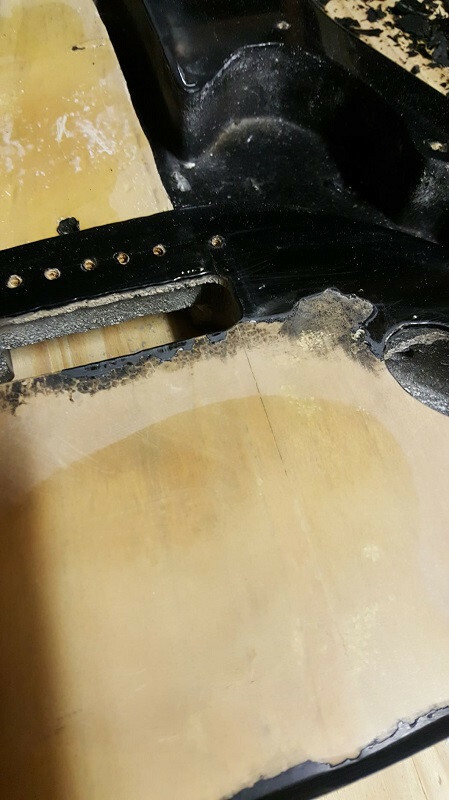 I'd drill 0.5mm holes in the crack, about 10mm deep, every 3-4mm following the crack, and then put superglue in the holes (with a hypodermic needle on the superglue bottle), being carefull not drill too deep and into the fretboard, of course. Superglue should spread the entire length of the crack. Theoretically! 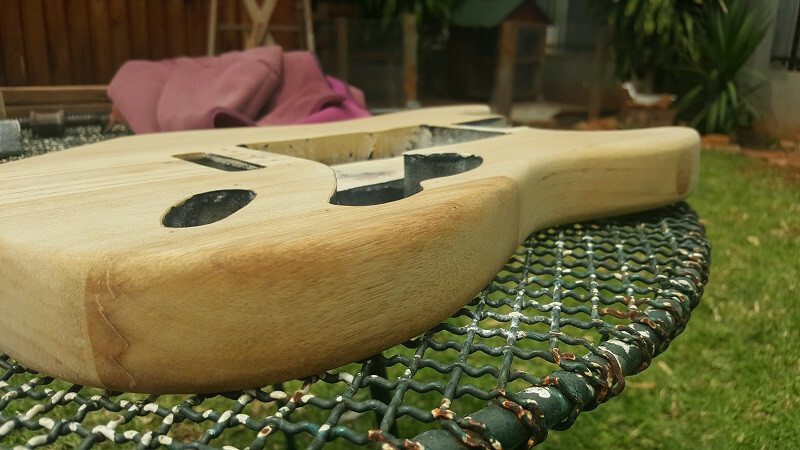 But since it's a project guitar, it's worth a try before getting into more serious work. 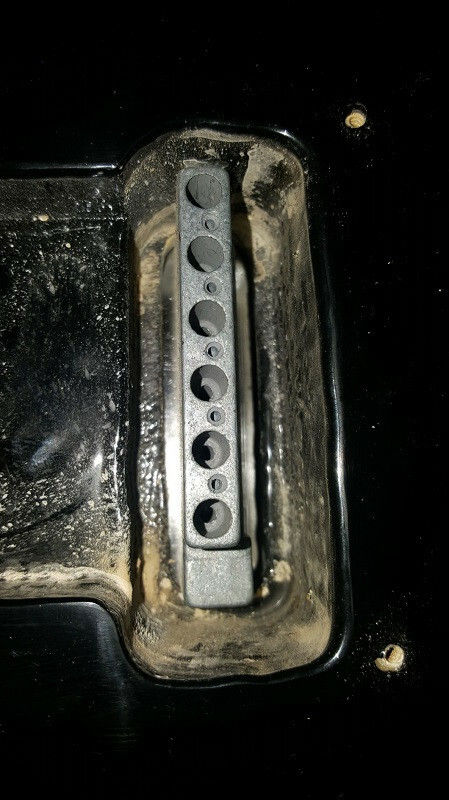 I've this technique to fix/stabilize the stud inserts that hold the screws for the floating tremolo on a friends Indonesian Squier. That was 3 years ago and the studs have not moved yet. That flame neck looks really, really nice! For a beautiful satin finish (not gloss) and very nice FEEL when you play, I'd go with Danish Oil or Woodoc 10. If you don't mind a little bit "stickier" feel but fantastic look, then Tru Oil will work great. I'm not an expert in finishes but I I've used those specific 3 finishes a lot. 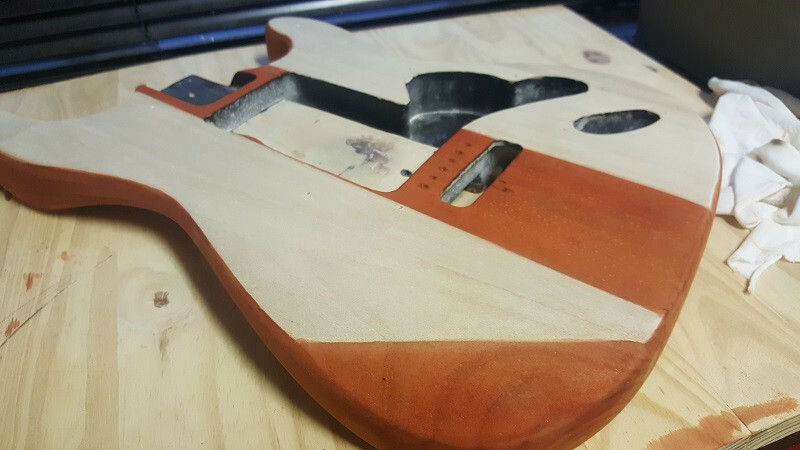 You could use any of these finishes on the body as well, of course, and they will all make the grain much more visible and really pretty. You can put any stain before. They all work well, and even better, they're really easy to use (if I can do it, anyone can!). But sanding needs to be done properly! BTW, guidothepimp already offered and 12 inch radius block but if you need a 9.5 block, I've got one so you can borrow it. You want a repair that isn't visible to the eye from the side. I would first fill the crack with Super Glue, then clamp it by drilling from side to side and putting a counter sunk screw and bolt in. 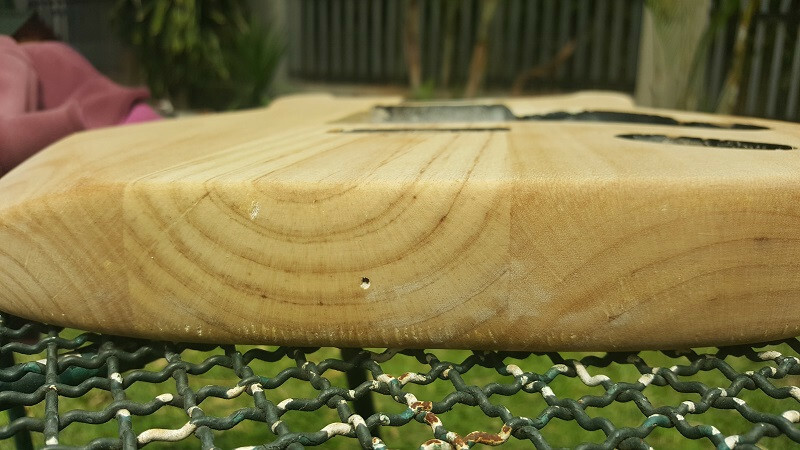 The hole will be hidden by the heel slot in the guitar body. You could also potentially put it above the top two holes if there is enough meat in the wood. @morph & @modulator thanks for the tips and advice. I think a sunk in bolt will do the trick nicely and I assume it doesn't have to be a 'huge' big bolt either. Maybe a 6mm or max an 8mm? (Cant believe i am going to be drilling a hole through my guitar's neck. Ouch. 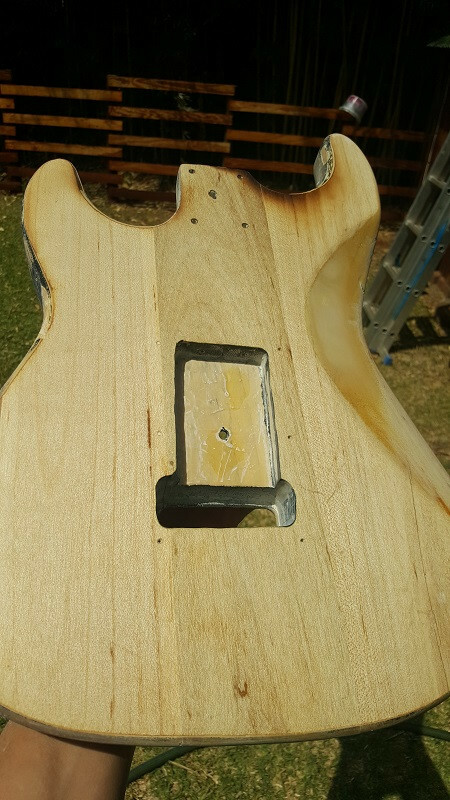 I also found 2 cracks on the body when I stripped the rest of the finish last night. Don't know how/when this could have happened. Possibly bought like that. I now have to strip the wood sealant. I was thinking a sander, but if there are easier ways then please do tell! Hectic busy at work at the moment so I will reply and update as I get time. Thanks again for the advice gents! 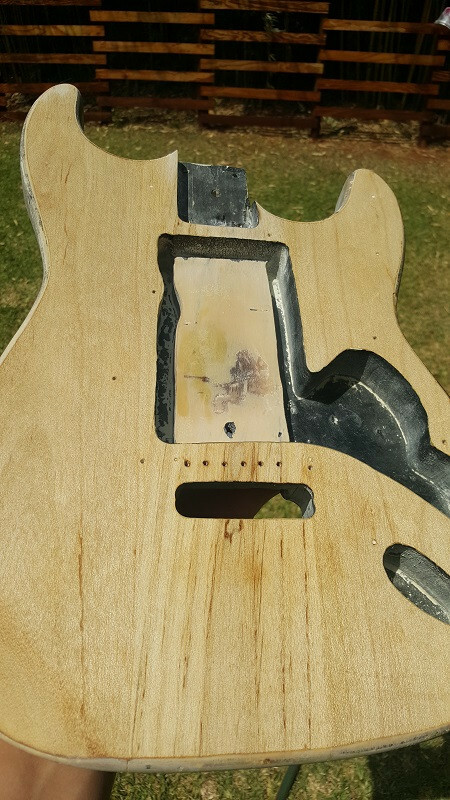 wern101 unfortunately for the sealer.. sanding is the way. Thats tough stuff. wern101 Maybe a 6mm or max an 8mm? (Cant believe i am going to be drilling a hole through my guitar's neck. Ouch. 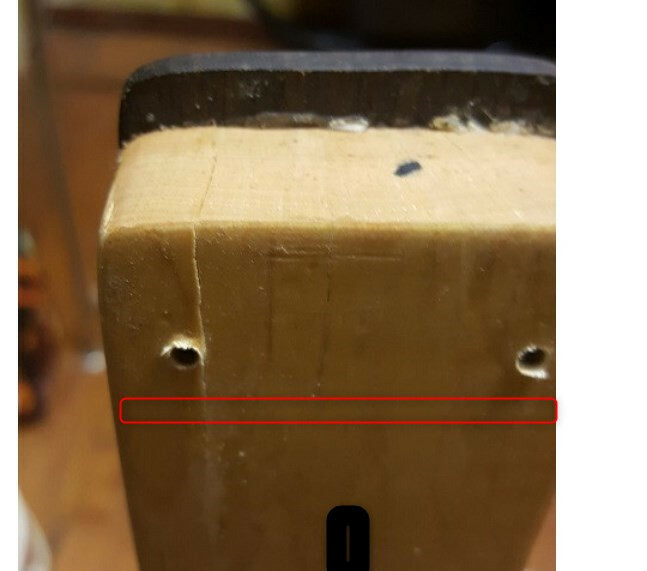 I was actually thinking when i read @morph post that something like a No5 x 18 self tapping countersunk screw would be perfect..
Then you don't have to drill all the way through.. so no need to stress about the truss rod..
and you could add maybe 3 on the one side.. just give a pilot hole first , to aid with screwing in. the crack open a bit and wick some glue in.. that should be perfect. morph I am wondering if the first crack was not caused by those holes used to fasten the neck to the body being too small in the first place. This is quite possible Morph. Looking at the position it is actually quite probable. tedibear so no need to stress about the truss rod..
guidothepimmp . sanding is the way. Thats tough stuff. 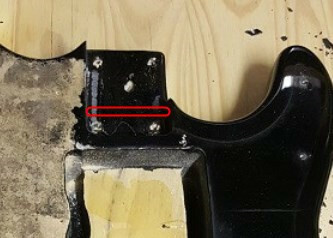 For the neck crack.. if it opens slightly.. you can wick glue in there and clamp it.. i would attept glue before routing.. dowels etc.. but thats just me..
Make sure you drill a pilot hole that is the same size as the inner shaft of the screw. 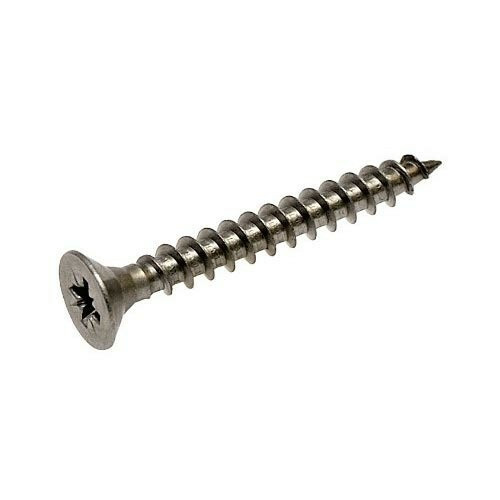 If you don't or it is too small the screw could cause another crack. I am wondering if the first crack was not caused by those holes used to fasten the neck to the body being too small in the first place. It does run right past the first hole. Well, on the weekend I got a little further. 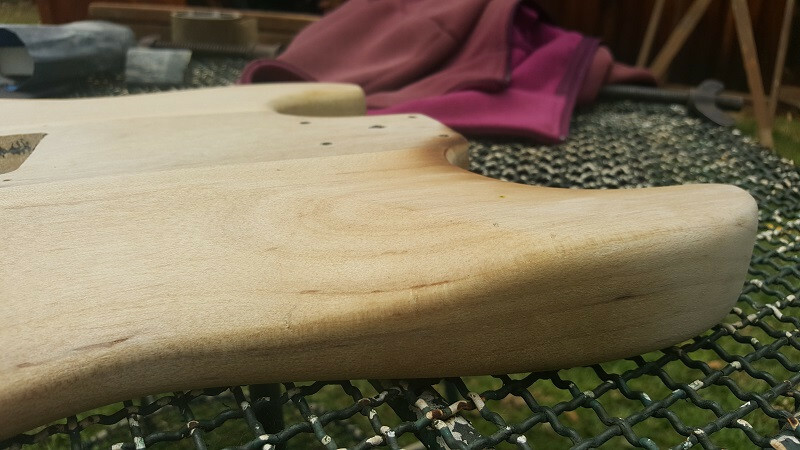 Managed to get the front and back completely sanded down and the grain is now nicely visible. I still have to do the sides and contemplating if I am going to bother with the 'insides' - although I may want to use inside grain to test techniques out. Meanwhile @tedibear mentioned that we will have a bit of a 'competition' once both our projects are completed. Purely based on 'who made it prettier' with a forum vote. No prizes, just bragging rights. Thanks again for the posts and replies. Much appreciated. I'll update soon. I made little progress over the last week. Really just focused on getting the sides done...and those horns. The contours of the cut away's have me thinking of all kinds of possibilities. I can hardly wait. Just killer busy at work right now AND having to order stuff for this build... and wait for it to arrive. Zorand That flame neck looks really, really nice! For a beautiful satin finish (not gloss) and very nice FEEL when you play, I'd go with Danish Oil or Woodoc 10. If you don't mind a little bit "stickier" feel but fantastic look, then Tru Oil will work great. 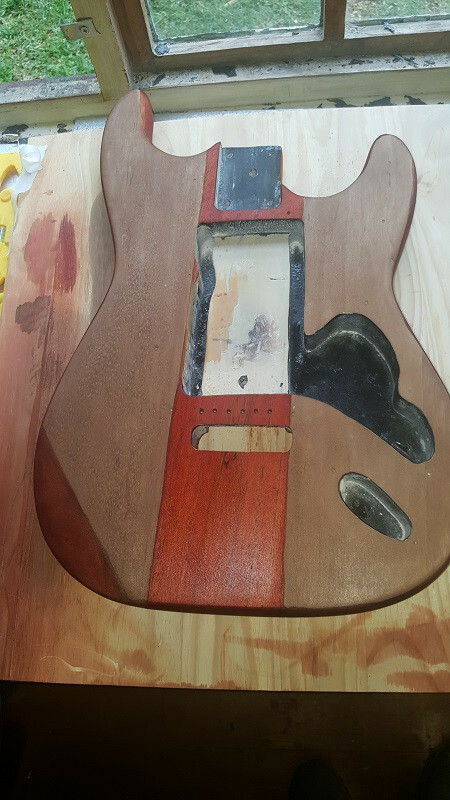 I think the grain is very workable and I want to try and go natural but with a slight stain, making the grain come alive with a bit of red here and there...lots to read up about and lots to figure out. sounds good..cant wait to see it come to fruition.. I have heard that metal pick-guards just need to be padded underneath (i.e glue some fabric underneath) to help with vibration noises etc..*situation needed. but am liking the general concept. think it will be a stunner of note. P.s what are you intending to do with the spring cavity?, are you going to use your back plate? or leave it open? 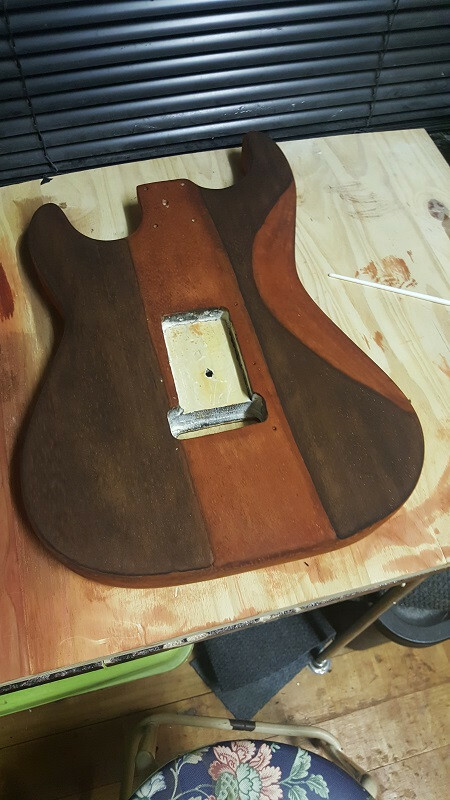 I've read up about the pickguard a little bit and it doesn't seem to be a problem to use copper, but I've not seen anyone mention the issue with vibration noises. Will look into it! I hope that the picture i have in my head is what will actually be on the guitar once done. Hopefully it will be a stunner. We'll see. tedibear P.s what are you intending to do with the spring cavity?, are you going to use your back plate? or leave it open? Not sure yet. I will be shoving a block of wood in there though. 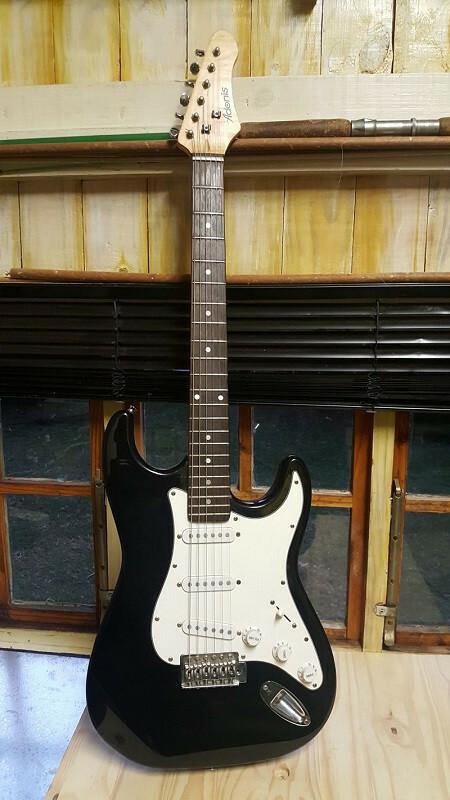 The article about 'strat tone' (https://community.guitartalk.co.za/d/26802-the-ultimate-guide-to-strat-tone) noted that this may actually assist with helping the treble not sound as 'sharp' - Apparently Clapton is a fan, so why not. I think I will close it up though. Righty Oh. I made some progress over the weekend. Finally. I decided to go with a two-colour option, just to spice things up a bit. I got ‘cherry red’ and ‘light oak’ stains that I added as below. The idea being to go with the natural laminate lines and not ‘square’ or symmetrical or anything like that. So I started with the red and was happy with the way things were progressing. 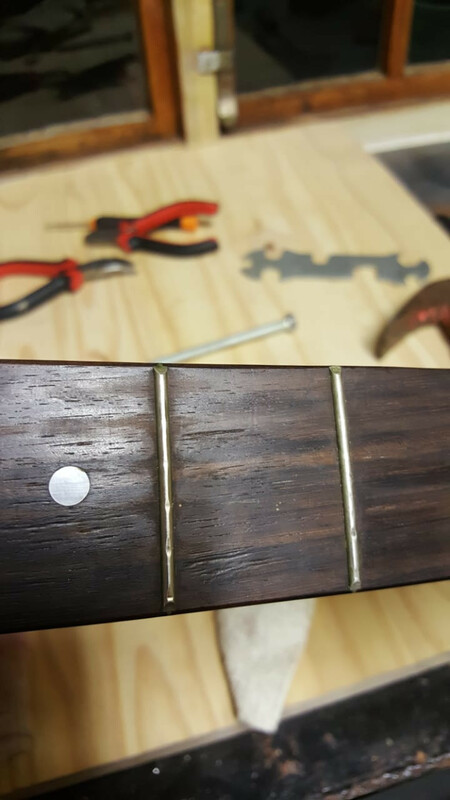 I found a few places that the red simply did not want to penetrate – little scuff marks and, possibly, places where the original finish may not have come off properly. (I’ll deal with these later). 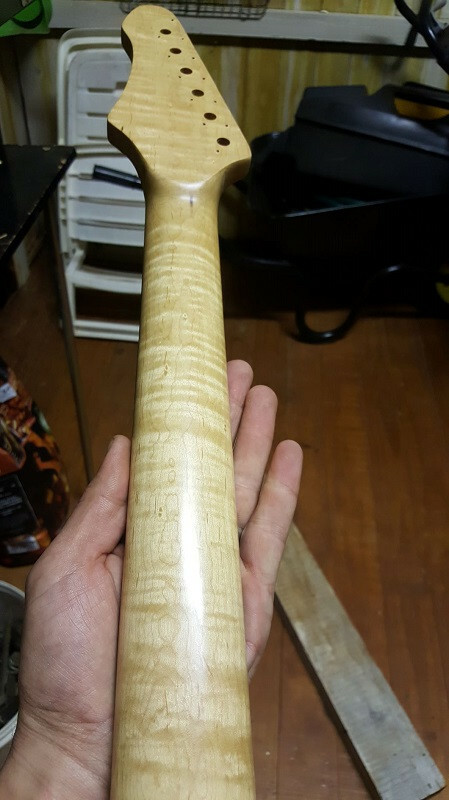 I then did the oak colour and found that my technique of using a cloth and sponge was working well, until my wife pointed out that most of the colour was going into the cloth. (face palm) She (brilliantly) then applied a layer with a small paint brush and the immediate colour pop was AMAZING. Needless to say, the photos don’t show that. I am hoping it will pop when the final oil/sealant is applied. So that’s where we are now, Hope to update soon. Tru-oil has been ordered and should be here within the week. Lots of refinements to do, straighten lines and what not, but at least the body has some colour! wern101 immediate colour pop was AMAZING. Needless to say, the photos don’t show that. I am hoping it will pop when the final oil/sealant is applied. if you think it was amazing then. just wait till its sealed.. its going to be pantie dropping awesome. Well that is good news indeed. I mean, you kinda know that is what is going to happen, but at the same time worry it won't. Looking forward.